Posted on January 28, 2014 by E.M. The week started out strong because of MLK’s holiday when I was able to do yoga and go on my run. However, on Saturday my ankle was hurting a bit so I decided to move my long run to Sunday. I finished the 9 miles in 1h43, which is not that good, but at least it felt great. I love going from Iddlewild to Mayberry Park and I can’t wait for my runs to get longer so I can explore the trail even further. Right around mile 4, near Dorotskar Park there is this glacier like sheet of ice that looks cool and weird at the same time. I have no idea what it is. Geologists of my life, please help. 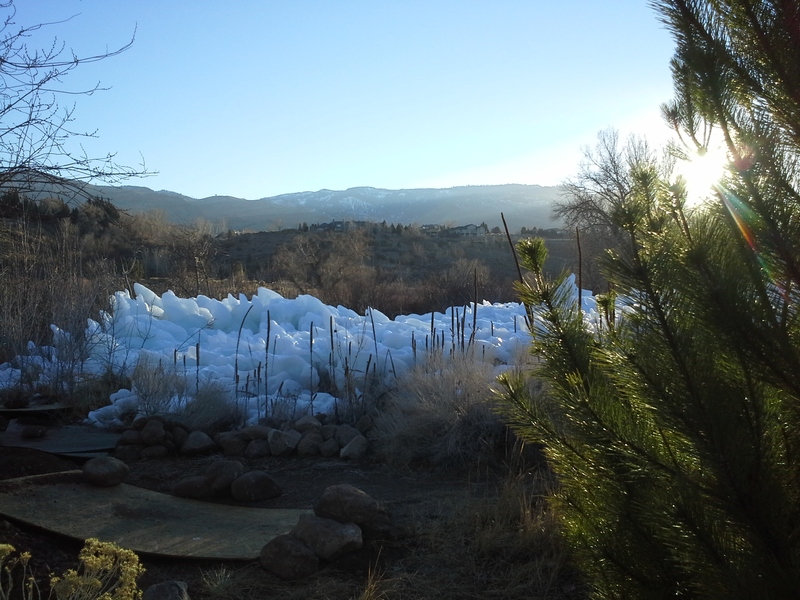 We haven’t had snow in over a month and temperatures have been in the 50’s, but all this ice is still by the river, and only on this one spot. This past Friday our health challenge at work started. We have to weight in every Friday and you pay $1 for each pound you gain. The team that loses the most weight by April 18th wins a cash prize. I’m part the SLMR team (named after our children and pronounced “slimmer”). I’m so proud of my teammates, who started jogging and eating healthier already! I don’t have much weight to lose, but at least I hope I don’t gain any. I joined two of them for a walk around the marina on Sunday, but then had a milkshake right afterwards. Can’t get rid of my sweet tooth, but at least now I have a strategy to satisfy my cravings while not eating the whole thing: let the boyfriend order the fattening stuff while I’ll order the salad.